Welcome to the 6's…the first of the "Meanies." Many students believe these puzzles are going to be harder, but never fear! With the foundation of knowledge built in the Multi-Facts "Basics" puzzles, they are prepared to succeed in the "Meanies" as well. 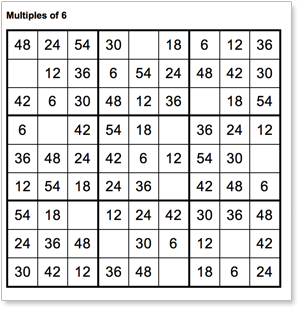 Multiplication facts are challenging for some children to learn, so why not make learning fun? Time spent in class is not enough for children to learn their facts; they also need to spend time at home practicing. Our puzzles will help your child see the patterns and understand the logic of the multiplication tables while having fun and learning while they play.